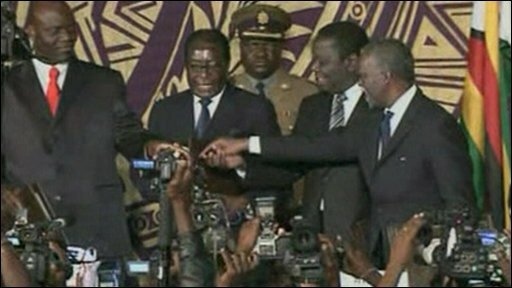 Zimbabwe's President Robert Mugabe has signed a historic power-sharing deal with his long-time rival, opposition leader Morgan Tsvangirai. The two smiled and shook hands at the ceremony in the capital, Harare, which was attended by African dignitaries. Mr Tsvangirai said the agreement provided the best hope for Zimbabwe and called on President Mugabe to work together to implement the deal. Mr Mugabe said he was committed to national unity and would do "his best". Mr Mugabe, Mr Tsvangirai and Arthur Mutambara - leader of a breakaway faction of Mr Tsvangirai's Movement for Democratic Change (MDC) - signed the agreement in front of some 3,000 invited guests in Harare's International Conference Centre. The signatories were introduced in the terms used in the agreement - Mr Mugabe as president and Mr Tsvangirai as prime minister. To rapturous applause, the leaders shook hands after exchanging signed copies. Mr Mugabe accused the former colonial power - the UK - of meddling in his country's affairs by calling for a "regime change" and by imposing sanctions. The deal calls on the UK to pay compensation to the white farmers who have lost their land under President Mugabe's controversial land reform process. But he received loud jeers when he said opposition parties in Zimbabwe and other African nations used any means, "including violence", in order to achieve power. He said there were "lots of things" in the deal that neither leader liked but that they would work together to "find our way". "As long as salient principles are recognised, there will be room for more agreement," Mr Mugabe said. In his speech, Mr Tsvangirai said the agreement was a "product of painful compromises" and that it did not provide "an instant cure" to the fortunes of Zimbabwe. "I've signed this agreement because I believe it represents the best opportunity for us to build a peaceful and prosperous democratic Zimbabwe," he said. His hope for the future was stronger than the grief felt for "the needless suffering of the past years", he said. In a gesture of reconciliation, Mr Tsvangirai quoted a speech on reconciliation made by Mr Mugabe in 1980, saying "it is time to turn our swords into ploughshares". The MDC leader said his first priority was to stop Zimbabwe's devastating food shortages and open the country to aid from the international community and its African neighbours. "This unity government will let businesses flourish so our people can work and provide for their families with pride," he said. The new Deputy Prime Minister, Mr Mutambara, said the compromise agreement was a victory for Zimbabwe. The ceremony was somewhat marred, however, by clashes between MDC and Zanu-PF supporters outside the conference centre, who threw stones at each other and trampled part of the perimeter fence. The BBC's George Alagiah in Harare says that the mood among ordinary Zimbabweans is one of relief rather than outright jubilation. People just want to get on with their lives. The full details and content of the deal have not been confirmed but it proposes a 50-50 division of power, with Mr Mugabe remaining head of state and head of the cabinet. Morgan Tsvangirai will head a council of ministers, which will be responsible for the day-to-day managing of the country's affairs. The MDC and its breakaway faction are expected to have 16 ministers, while President Mugabe's Zanu-PF party will have 15. The BBC's Adam Mynott says the eyes of Zimbabwe's neighbours, Africa and the whole world will be fixed now on seeing whether this deal does result in a genuine sharing of executive authority. Negotiations started at the end of July, with a breakthrough coming late on Thursday after negotiations mediated by South African President Thabo Mbeki. Speaking after the accord was signed on Monday, Mr Mbeki warned that the make-up unity government had yet to be finalised. "Some discussions have already started about the constitution of this inclusive government, [but] they have not yet concluded," he said. "I am confident that they will do so as soon as possible." While welcoming the deal as a "great day" for both Africa and the world, African Union chairman Jakaya Kikwete also noted that doubts remained over how long it would last. "Will it hold or will it not? That is the question," he said. 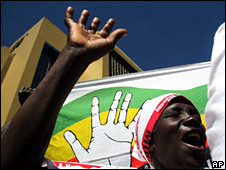 Some MDC members have called the power-sharing deal a climb-down, although others have said it is the best available. The deal opens the way for international donors to help to revive Zimbabwe's economy, where inflation is at more than 11,000,000%. The International Monetary Fund, which suspended financial and technical assistance in 2006, said it stood ready for talks with the new government about its policies to stabilise the economy, improve social conditions, and reduce poverty. EU foreign policy chief Javier Solana said a decision on lifting sanctions on Zimbabwean officials had been postponed until October. Mr Solana said the EU needed to study the details of the agreement but that he expected it to open "a new page" for Zimbabwe. The US government expressed cautious optimism about the deal, but stressed that it was "anxious" to see the full details. "Our number one priority is that you have a legitimate government in Zimbabwe that represents the will of the people," said White House spokesman Gordon Johndroe. The UK Foreign Secretary, David Miliband, said it would want to see the administration make significant progress before it considered lifting sanctions. Mr Mugabe, in power since independence from Britain in 1980, won a controversial presidential run-off election in June. He ran unopposed after Mr Tsvangirai withdrew, claiming the MDC was the target of state-sponsored violence. In the first round of the presidential election in March, Mr Tsvangirai gained more votes than Mr Mugabe but official results say he did not pass the 50% threshold for outright victory.